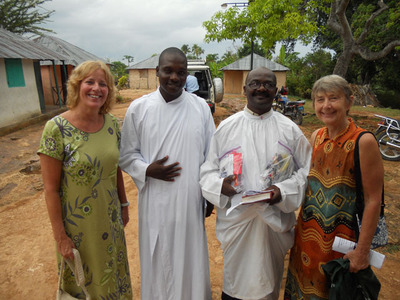 In April 2012, church members Mary Margaret Smith and Janet Wilson embarked on a trip to Haiti. Their mission was to establish a relationship with a school there that they and All Saints' could continue to support when they returned to the islands. Their vision stemmed from the urgent need for help in a country that was devastated by an earthquake in 2010. Through a Hope for Haiti dance, grants, and the support of church members, they were able to raise funds that helped provide supplies and other items for their trip. The following article was written by Janet Wilson, and the photos in the accompaying slideshow were also provided by her. The mission trip we took to Haiti in April was amazing, however the spiritual journey for me started well before we left Kaua'i. Planning the "Hope for Haiti" dance and talking with friends, I was able to articulate and share why we were going to Haiti. It was heartwarming to hear the experiences of others with their mission trips and how it transformed their lives. As All Saints is aware, there were a lot of questions as to why we would go so far and what we were going to do there. Mary and I wanted to find a school and/or church that we connected with and felt we could develop a lasting bond. A partnership between All Saints and Haiti. Mary and I were met by Pere (Father) Ajax and his assistant, Angela Galbreath in Port au Prince. They assist different organizations/people that want to help Haiti in developing partnerships that meets the goals/mission of the trip. We traveled to Les Cayes which is south and west of Port au Prince and were connected with Fr. Colbert. He is responsible for several churches and stations (the name given when there is not a physical church for worship). We stayed at his Rectory with his family and were treated as if we were part of their family. This definitely allowed us to experience first hand what it is like to live there, including the loving hospitality of the Haitian people. Even with the most meager resources we were fed very well and given a place to sleep and feel safe. We also got to experience what Haitians do on a regular basis - sporadic water and electricity issues. Power outages were a daily occurrence. I cannot say I was shocked by much that we saw and experienced but then again I was expecting dire conditions from the beginning. It is unfortunate that people have to use the same stream of water for bathing, washing their clothes, washing their vehicles and for drinking and who knows what else. We were blessed to attend two Church services and meet with their leaders. The first was Station Sainte Croix in Jeremie and the second was Station Sainte Marie Madeleine in BonBon. Both of these churches/stations worship basically under a "lean to" with dirt floors, sheets for walls and a metal roof. We were given a very special welcome with signs and decorations and I felt quite honored to be there. The people were dressed in their Sunday best and I was impressed with not only the service (which of course we couldn't understand as they speak French/Creole) but also special songs and dances! Thankfully Angela was able to help translate and explain what was taking place! Mary and I passed out the Chaplets to the adults and bags with various goodies to the children. Station Sainte Croix is in need of a new space to worship so we would like to assist them with finding a new place. We also would like to help Sainte Marie Madeleine as they do not have a school for their children. Of course our resources can only go so far. But as Fr. Ajax and Angela advised, partnerships should start small and grow as we learn. Fr. Colbert has a school associated with his church and rectory, Ecole Saint Sauveur Des Cayes. Mary and I were given a tour of the school and were quite impressed with how well behaved the students were. There were several classrooms, each grade with their own uniforms. We caused quite a stir with taking pictures as the students rushed to the classroom door in order to get a look at the pictures. We later went to visit a school in Camp Perrin, 30 minutes outside Les Cayes. When Mary had asked Fr. Colbert what we could bring with us, he had asked for supplies for this school. We went room by room and delivered white boards with markers and took pictures, and Fr. Colbert explained who we were and why we were there! We also gave books and puzzles to Saint Sauveur School. Our last night was spent in Port au Prince and the drive from Les Cayes to Port au Prince was most eye opening and sad. The recent rains had caused many mud slides and everywhere you looked, there was a mess. So many people are still homeless and living in tent cities, that is seems overwhelming. Haiti needs a lot of help in many ways, but the people are so humble, loving, spiritual and grateful for what they have. I hope that All Saints can help make a difference in their lives and in the process, ours.